Elastography of the prostate has shown great promise to help diagnose prostate cancer with high sensitivity (∼70–90 %) and specificity (∼72–87 %) when used for biopsy guidance. The basis for using elastography is given by empirical evidence (i.e., digital rectal examination) and quantitative experiments which have demonstrated that prostate cancer is often stiffer than surrounding prostatic tissue. Using ultrasound or magnetic resonance imaging along with a mechanical excitation, it is possible to generate images of the stiffness of the prostate, thereby guiding biopsy procedures and focal therapies to the stiff regions of the prostate. Several challenges exist with the clinically implemented version of compressive elastography; thus, multiple other elastographic methods are currently under investigation to determine their utility in the context of guiding biopsy procedures, guiding and monitoring focal therapies, and facilitating watchful waiting. 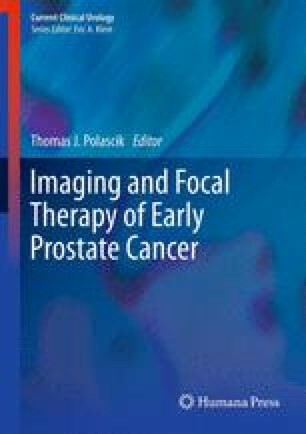 This chapter provides a review of the fundamental principles of elasticity imaging, a summary of clinical reports of the utility and challenges with commercially available prostate elasticity imaging systems, and an overview of current research in this field.